One of the recurring questions that I get asked a lot is “what book is this from?”, usually from people who are looking to revisit a book they vaguely remember from . While I can answer a fair number of these on my own, there are some that stump even me – but thankfully, rarely you, the site readers! So without further ado, here are a few of the more recent Cozy Mystery identification questions! Trying to find this book I read about 1980, it was the first book published by this man, his name was Jonathan and I cannot remember his last name. Book takes place in New Orleans about a mother and young son who run a boarding house for the elderly. There is corruption in the local government and voodoo too. It was exceptional! I would love to read it again and find the author. I am searching for the name of a female author I read several years ago, I think at least three mysteries. All took place in Minneapolis-St Paul. The heroine/detective was a lawyer and I believe worked in the DA’s office. There was a Christian-religious theme to the books. Does this ring a bell with anyone? Would greatly appreciate. EDIT: Possibly the Rachel Flynn Mysteries, by Susan Meissner? EDIT AGAIN: Paul posted in the comments below, and agrees that this seems to be the Rachel Flynn Mysteries by Susan Meissner! So, if you think you’ve got the answer to either of these stumpers, please let us know in the comments below! Thank you! 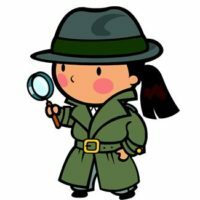 I don’t know about the books, but that chibi-gumshoe is awfully cute! The description from Paul P. sounds a little like the Rachael Flynn Mysteries by Susan Meissner, except the heroine is a defense attorney instead of a prosecutor. The first book is Widows and Orphans. Lisa, thanks! I’ll put that up as a possible solution! Susan Meissner is it! Thank you so much. Paul, I’m glad we could help after all! I hope some one remembers the book asked about by Marion B. above. I’d like to read it too! Gram, I hope someone has a suggestion as well, though it isn’t looking good! Could the Minneapolis/St. Paul attorney be Beth Hartley in the Milwaukee Mystery Series by Kathleen Anne Barrett? They were published in the 90s. Julie, thanks for the suggestion, but the original question poster responded that it is probably another suggestion, Susan Meissner! Though the series you’re suggesting sounds good too!